Heathrow came under fire from senior politicians and environmentalists this weekend after bankrolling a community campaign group that claims to represent the “silent majority” who want a third runway at the airport. …………….. 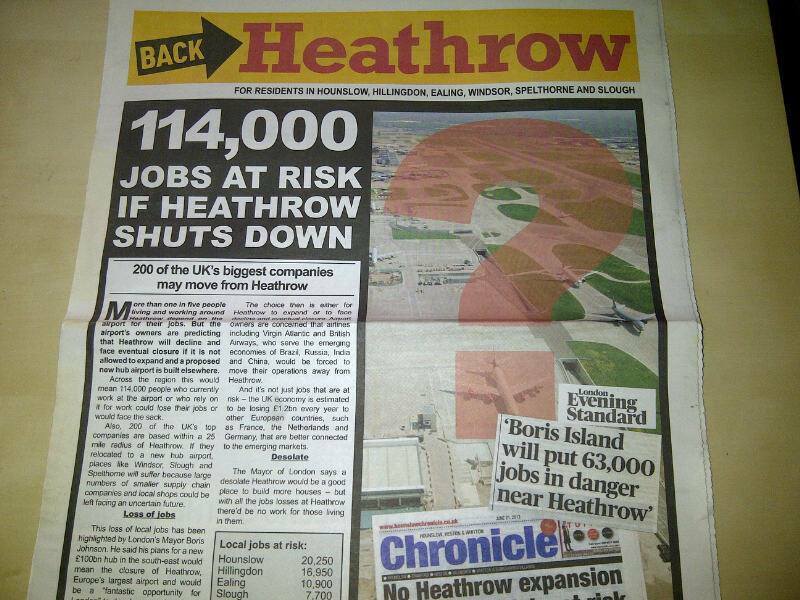 Designed like a tabloid newspaper, the leaflets include stark warnings that “114,000 jobs are at risk if Heathrow shuts down”. Three of the four newsletters delivered during the past year fail to disclose that Back Heathrow is funded by the airport. ….. “This is straight out of Big Tobacco and anti-climate-change-type strategies where you simply scaremonger through an ‘astroturf’ group that you set up and fund at arm’s length,” said Jeff Gazzard, a spokesman for the Aviation Environment Federation (AEF). 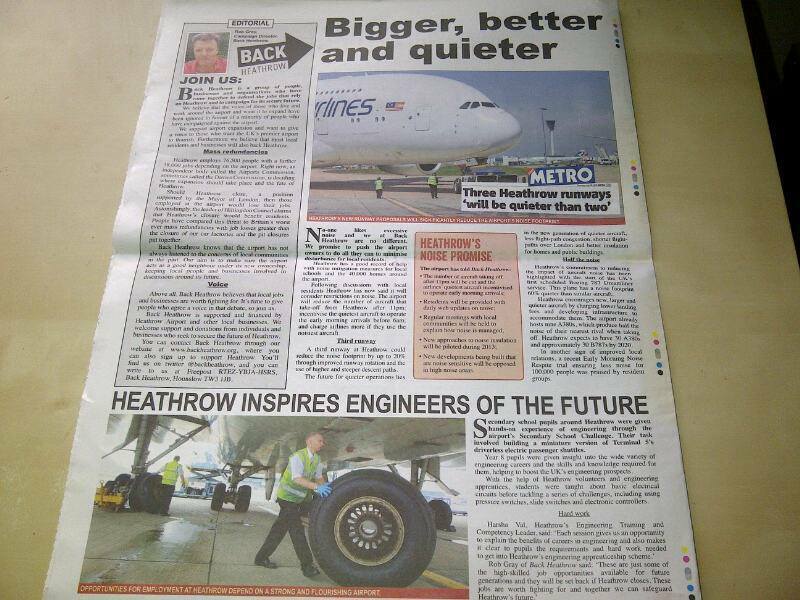 ………… The most recent newsletter, which was delivered to up to 750,000 homes, claimed more than 50,000 residents were supporting Back Heathrow’s campaign……….. [Rob Gray] set up Back Heathrow as a limited company in July 2013 with Nathan Fletcher, a senior PR officer at the airport. Fletcher, who is now Heathrow’s head of news, resigned as a director in April. Michael Appleton, Back Heathrow’s communications manager, is a former communications officer at the airport. ……………..the group had also received a donation from Heathrow Hub, a group that has submitted a rival plan to expand the airport, as well as smaller donations from residents and businesses. ……………. Asked by The Sunday Times after the [Putney] meeting how much funding the airport had provided, [Matt Gorman] replied: “I don’t know exactly.” He then refused to answer further questions. 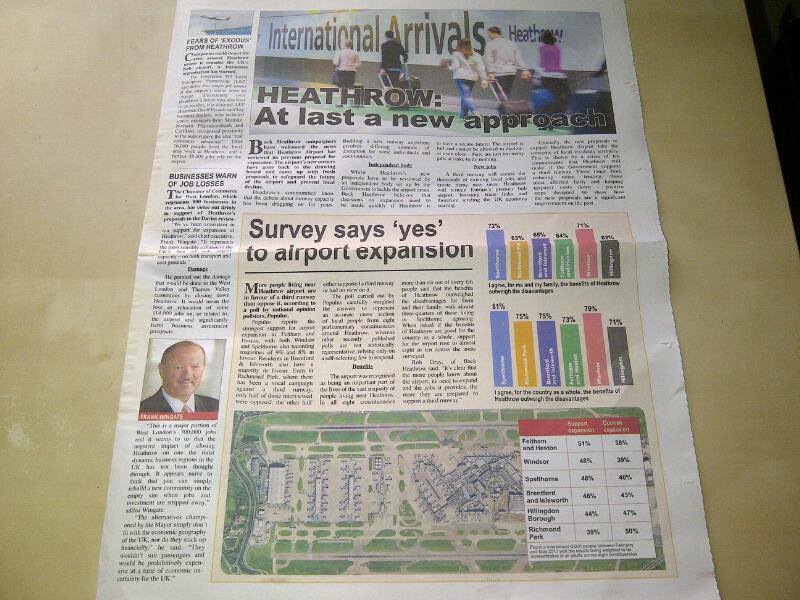 “Local people are supporting growth at Heathrow in their thousands. “Already 50,000 people who live near the UK’s only hub airport have signed up to Back Heathrow, one of the country’s fastest-growing campaigns. Back Heathrow wants to safeguard local jobs and secure a bright future for Heathrow, a major community asset. This means campaigning for the airport to grow, and standing against those who would let it suffer long-term decline or worse. But the reality is, there is absolutely NO prospect of Heathrow closing. Or of losing any jobs (except through the staff cuts the airport and the airlines etc make, in order to make cost savings). 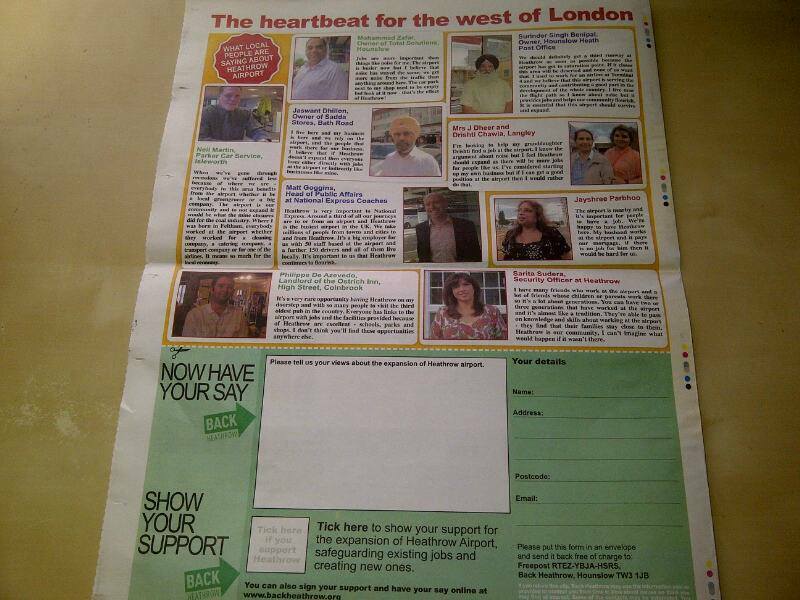 This has been a scare tactic using by Back Heathrow, from the start, to try to gain support. And to try to frighten people who work at Heathrow into believing their jobs could be at risk. I have been asked if I think it is worth responding to the survey, and having discussed the issue with the Richmond Heathrow Campaign, and HACAN, I feel very strongly that it is not. The reason, simply, is that it is extraordinarily disingenuous. The questions are crafted in such a way as to make it impossible for residents to express what I know from our referendum and countless opinion polls to be the majority view among people living in Heathrow’s shadow. In addition, the choice it presents is a bogus one – between expanding Heathrow and closing it. A few weeks ago, the new CEO of Heathrow admitted in Parliament that it was not true to suggest Heathrow would decline if it is denied an extra runway. The fact that his company is pouring vast sums of money into an outfit that continues to say the opposite is a poor reflection on Heathrow and a disservice to residents. Despite the scaremongering by Back Heathrow, the real choice is not between closing down Heathrow and expanding it. The choice is between pouring taxpayer’s money into creating a vast foreign-owned monopoly on one edge of our great city – or investing in a network and enabling London’s main airports to compete properly. This shocking Heathrow survey is part of a crude propaganda exercise, and I have no intention of contributing to it. I have instead placed it in my recycling bin and hope others do the same. Posted: Monday, December 1st, 2014. Filed in General News, News about Airports, Recent News.